Learn about our ham radio study guides! Helping others learn about radio is very rewarding for many experienced hams. KDØMUW & Garrett. Why Ham Radio? Folks get involved with ham radio for all sorts of reasons. It is a magnificently diverse endeavor. It can be a fun technical hobby, a way to provide community service, or an important facet of family emergency preparedness. You may enjoy the local on-air social community, the excitement of international radio contacts, or the challenge of operating from the field or mountaintop with portable equipment. You may relish building your own circuits and antennas, experimenting with digital communication modes, or learning and mentoring others in their own efforts to become amateur radio operators. No matter your initial motivation, I hope you will explore at least a few of the multiple facets that ham radio offers, learning and growing your expertise along the way. But first, let’s see how to get your ham radio license from the FCC. FCC Licensing: To become a ham radio operator you must obtain a license from the Federal Communications Commission (FCC). The FCC is the federal governing body overseeing the Amateur Radio Service, known colloquially as ham radio. The FCC currently issues three different amateur radio license levels, or classes: (1) Technician License Class, (2) General License Class, and (3) Extra License Class. The Technician License Class is the introductory level license and it must be earned first. The General License Class is an intermediate license level that may be earned after Technician Class. The Extra Class license may be earned following General Class. What’s the difference among these license classes? Transmit frequency privileges. The FCC license grants you the privilege of transmitting on a range of frequencies that have been allocated specifically for use by the Amateur Radio Service. As you move up in license class from Technician to General to Extra Class the range of frequencies on which you may transmit is expanded, with the Extra Class license granting full utilization of all Amateur Radio Service frequencies. But the introductory Technician Class license offers a fantastic set of frequency capabilities right from the git-go! We’ll return to the matter of frequency use, but let’s consider the practical matter of getting that Technician Class license. License Examination: Each license class is earned by passing an examination that tests your knowledge of amateur radio rules, regulations, operating procedures, and technical topics. A pool of exam questions has been established for each license class, and your examination will be comprised of questions drawn from the question pool. Each question pool is revised on a four-year cycle. As of this writing, the last Technician Class question pool revision was affected July 1, 2018 and it will be valid until June 30, 2022. The question pools are released to the public for the development of study materials and for individual examinee study and practice. The current Technician Class question pool contains 423 questions, each a 4-response multiple-choice format. That is, after reading the question you select the correct answer as A, B, C, or D response. The Technician Class exam is comprised of 35 questions selected from the question pool. You must obtain a minimum score of 26 correct responses, or 74%, to pass the exam. You can read the details of how Technician Class exams are pseudo-randomly constructed at this HamRadioSchool.com article. There is no longer a requirement to demonstrate competency in Morse Code for any license class exam. Very simply, you must pass the multiple-choice test to get your ham radio license. The question pools are formulated by the National Conference of Volunteer Examiner Coordinators (NCVEC). The exams are administered across the US by Volunteer Examiners (VEs) who have become certified and are sanctioned by the FCC to maintain the question pools and to conduct examinations. The VEs are licensed hams who volunteer their time and service to administer the examinations and help others become licensed. Where will you find an examination session? In more populated areas of the US there may be multiple exam sessions offered each month by various ham radio clubs or at ham radio events. In less densely populated areas the offerings may be less frequent and you may have to travel a bit to attend. You can search for upcoming listed and scheduled VE exam sessions at the web sites of the American Radio Relay League (ARRL), or you can find the contact information for a volunteer examiner in your state with the Laurel VEC and W5YI organizations, at the URLs below. VE exam sessions are regularly held in every state. Many exam sessions do not require any advanced registration and will state “walk-ins allowed.” Other sessions may require advanced sign up, so check the information closely or contact the VE in charge of the exam session. 1. A photo ID such as a state-issued driver’s license. Bring these items to your exam: ID, pencils, conventional calculator, fee payment. 2. Your social security number (SSN) or an FCC-issued Federal Registration Number (FRN). You can obtain a FRN by registering with the FCC in advance of your VE session. FCC registration info here. 3. A number 2 pencil, and a spare, just in case! But check with your exam officials, as some organizations are now using computer-based exams. 4. A conventional calculator with all memories cleared. Cell phone calculators are usually not allowable, and phones should be silenced or turned off during the exam. 5. A check, cash, or money order for the VE exam fees, usually about $15.00, although some VECs require the sponsoring radio club to cover your exam expenses. For instance, Laurel VEC-affiliated exam teams do not charge you for the exam. However, before you take your exam you will need to prepare for it! Preparing for the Exam: The topic of preparation for the VE examination is one that spawns a wide variety of opinions, so I will argue the HamRadioSchool.com philosophy here, with rationale to back it. I’ll also comment on taking classroom offerings and getting the support of an experienced ham. It was really hard to memorize the correct answers without knowing what the radio terminology meant and without understanding what the questions were actually about. I don’t really know what to do now that I have my license because I didn’t really learn anything yet. The second theme is almost always followed with the request, “So, can you help me get started and tell me what I need to do to get on the air?” And many, many other questions ensue in random fashion. There is a better way. Really Get It! The HamRadioSchool.com motto is “Really get it!” That means, of course, to really understand ham radio. We have produced our books and supporting web and app materials so that you can easily learn radio concepts while simultaneously preparing for the VE exam. It is quite literally 2-for-1, more bang for the buck, greater benefit for the time allotted to preparation. If you are going to spend the time in preparation to get your ham radio license, you might as well actually learn while you’re at it! You will really understand what the exam questions are asking. You will recall the correct answers to exam questions easily, vastly increasing your ability to pass the exam on the first try. You will have a clue about how to proceed with your first radio and how to get on the air. You will be a competent on-air operator who earns the respect of your fellow hams. You will have more confidence to get on the air right away and not delay due to uncertainty. I have seen this hundreds of times. The contrast between the brainless memorizer and the “Really get it!” new ham is stark and obvious. Dedicate yourself to actually learning something while you practice the exam questions and you will be a much happier beginning Technician. Of course, there are other exam preparation materials on the market besides HamRadioSchool.com. Some of those promote memorization only. Some of them offer tremendous depth well beyond the knowledge required to pass the exam and to get started operating, and often involve a very tough read for beginners. We believe HamRadioSchool.com strikes a gentle balance between those poles. Our books and other products provide easy-to-digest explanations and truly prepare you for the exam while instilling good introductory knowledge of amateur radio. Learning about ham radio in a classroom has the advantage of hands-on activities. Bob KØNR, instructor. Taking a Course: Many clubs offer classroom courses to help you learn and get your ham radio license. Often these courses will utilize a book like the HamRadioSchool.com Technician License Course as the foundation for the classroom presentations, and a knowledgeable instructor can add much experience, alternate explanations, and hands-on activities in the classroom. Having an instructor present to answer your specific questions and to show you radios, antennas, cables, and components is a big advantage. If you have the opportunity to take a class, I highly recommend you do so. Having an Elmer coach you can rapidly improve your knowledge and skills. Stu WØSTU and Mark WØATK. What’s an Elmer? An Elmer is an experienced ham who mentors beginners or the less experienced, advancing their knowledge in a personal way, usually with much hands-on radio operation and oversight. Finding a good Elmer can be a huge advantage for rapidly moving ahead with your amateur radio acumen. Finding the right Elmer for you can sometimes be a challenge, but engaging a local ham radio club can often provide fertile hunting grounds. Investigate any local clubs in your area, attend a few meetings, meet the hams and inquire about classes, learning, and Elmering. If there is a good fit, you will usually know it intuitively. Do-It-Yourself: If you don’t have the advantage of class offerings or local Elmers you can still be very successful on your license exam and learn on your own. The HamRadioSchool.com integrated learning system of books, web materials, and mobile apps is designed for the do-it-yourself beginner. Give it a try, ace your exam, and really get it. Licenses, Frequency Privileges, and Operating: Let’s return to the matter introduced earlier of the classes of amateur licenses, those frequency privileges that each license class affords, and the type of on-air operating you can do as a ham with those license classes. This will give you a bit better understanding of what you can do with a ham radio license. Briefly first, let’s cover a couple of simple radio concepts to make the differences among license classes and on-air operations more easily understood. Here I will define the concepts of frequency bands and of operating modes. Frequency Band: A band is simply a contiguous range of radio frequencies. In simple terms, radio signals wiggle back-and-forth with electric fields and magnetic fields as they fly rapidly from antenna to antenna. The rate at which the signal wiggles is its frequency. The most commonly radio frequencies a new Technician Class licensee will use are expressed in millions of cycles (millions of wiggles) per second, or in hundreds of millions of cycles per second. The unit of frequency in ‘cycles per second’ is called hertz, and millions of cycles per second is megahertz (MHz). Frequency bands are defined ranges of frequencies, some of which are allocated by the FCC for Amateur Radio Service use. Imagine a range of signal wiggles from perhaps 144 MHz to 148 MHz, and you have a frequency band. The FM radio dial in your car radio represents the commercial frequency band of 88 MHz to 108 MHz, and you can tune your radio across that band to any of the stations transmitting within it. The FCC has allocated many such bands for Amateur Radio Service use within the vast radio frequency spectrum. These are the ham bands, and depending upon its band a signal will behave with different traveling characteristics, or propagation characteristics. Operating Mode: You have probably listened to AM radio and to FM radio with the commercial radio receiver in your car or home. These are two different operating modes, amplitude modulation (AM) and frequency modulation (FM). The difference between the two is the way that information is encoded into the radio signals. With AM the power (amplitude) of a radio waveform is altered to carry a signal such as audio voice information. With FM the transmitted frequency is rapidly varied (the wiggle rate) to carry similar information of a voice or music signal. In ham radio we use AM and FM modes as well as digital modes such as hand-tapped Morse Code or rapid computer-generated digital packets, and others. The mode is the method that is used to get information into, and back out of, the radio wave. With that brief sideline, we’re ready to discuss the license classes and what you can do with them. 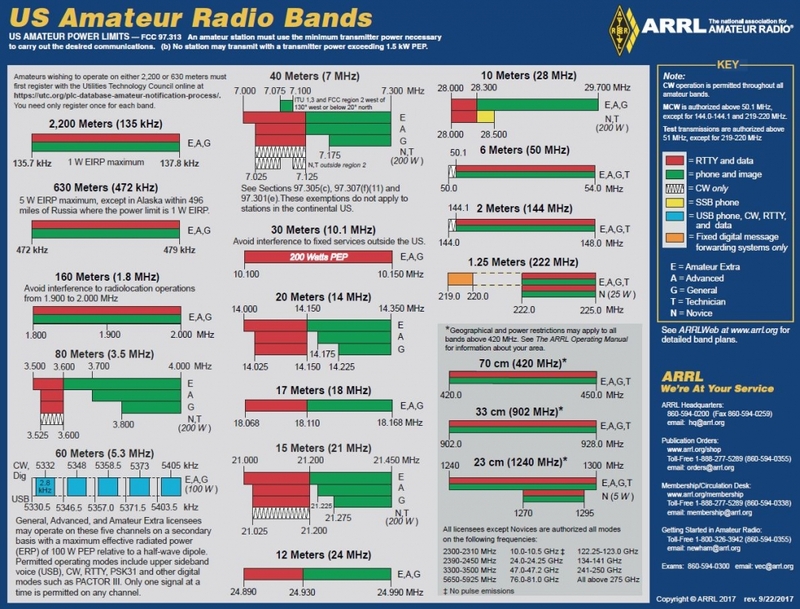 You may want to reference the US Amateur Radio Bands chart from the ARRL as we examine each license class transmit privilege. Technician License: With your new Technician Class license you will have complete access to amateur radio frequency bands of 30 million cycles per second and higher. These are in the broad categories of radio frequencies termed Very High Frequency (VHF), Ultra High Frequency (UHF), and even higher microwave frequencies. You can use these bands for voice modes including AM and FM, and you may use these bands for digital and Morse Code signals. The VHF and higher frequencies tend to be locally propagating signals, traveling somewhat greater distances than visual line-of-sight distances. With an antenna on a high mast you may expect to transmit and receive a distance of several miles, depending upon terrain. Many areas employ amateur radio repeaters to extend the effective range of communication. A repeater station receives your signal and retransmits it, usually at higher power and from greater elevation than your own station allows. Using local repeaters on VHF and UHF bands you may be able to communicate many dozens or even hundreds of miles. Many amateur operators enjoy participating in local nets, or on-air meetings of multiple operators, using their VHF and UHF privileges, and especially with the use of repeaters. These Technician frequency bands may also be used to communicate long distances via satellites orbiting the earth that repeat amateur radio signals hundreds of miles, and even to contact astronauts on the International Space Station! With a Technician Class license you also have limited privileges on bands in the range known as High Frequency (HF, 3 to 30 MHz). The propagation with HF frequencies is different from VHF or UHF. High frequency signals can reflect from a layer of the earth’s atmosphere called the ionosphere and travel well over the horizon, even around the globe. A Technician may transmit voice mode on one of these HF bands (10 meter band) and may transmit Morse Code on four HF bands, making radio contacts with amateur radio operators in other countries around the world. General License: The General Class license expands your privileges with both additional HF frequency bands and with additional operating modes. You maintain all of the Technician Class privileges, so the expansion of bands and modes is among the HF frequencies. You may operate on large segments of every amateur band allocated by the FCC, and you may use voice modes on each HF band where it is at all allowed (7 HF bands), making voice contacts great distances with ionospheric skip propagation provided by HF. Additionally, you are allowed to use Morse Code and digital signal modes in each of eight HF bands, with similar around-the-world propagation potential. Extra License: The Extra Class license further expands your transmitting privileges beyond General Class by adding to the General Class band segments. The General Class license privileges are maintained, but the entire range of each allocated band is accessible to the Extra Class licensee. This includes the use of Extra Class exclusive band segments for voice transmissions and for digital mode segments. So, higher license classes provide greater access to HF frequencies that can propagate well beyond the local area, and properly operating on these frequencies requires somewhat greater knowledge and skill that is tested with the General Class and Extra Class license examinations. A Little About Radios: You may have figured out by this point that in order to utilize the different transmission modes available to ham operators you will need a radio that can send and receive signals using those modes. Let’s consider a few basics about radios, or transceivers. FM Transceivers: As a beginning Technician Class licensee an FM transceiver will get you started. The most popular voice mode on those VHF and UHF frequencies and repeaters is FM. It offers clear, relatively noise free audio that keeps the operations simple and mostly trouble free. Practically all handheld transceivers are FM-only mode, and many transceivers designed for mobile ops in a car or for use as a base station at home are FM-only mode, and they are usually limited to one, two, or three of the VHF/UHF amateur bands in transmitting capability. Most modern FM transceivers can be outfitted for digital mode operations as well, transmitting position reports from a GPS receiver, or email, files, and text messages from a computer interface. A multimode transceiver offers several operating modes for voice, digital, and Morse Code operations. Yaesu FT5000. Multimode Transceivers: Multimode transceivers are typically more expensive, more complex in operation, and offer a greater range of capabilities. In order to transmit voice on the HF bands you will probably want to have a transceiver with single sideband mode. Single sideband (SSB) is a special form of AM that is very efficient with power. It is the most popular voice transmission mode on those over-the-horizon, long distance communication HF bands. It is very common for a ham to upgrade to a multimode transceiver upon upgrading to the General Class license since the phone mode privilege on HF bands is greatly expanded. In addition to voice modes such as SSB, a multimode transceiver will usually provide for Morse Code ops (more commonly known as continuous wave operations, or ‘CW’) and computer interfacing for various digital modes. I Got My License, Now What? After the glow of exam success has faded a bit it is time to get busy and get on the air! Get a radio and set up some channels, find the local repeaters, get involved with a club, maybe install a station in your car or put a base antenna up for better performance. There is no shortage of things to do! A handheld “HT” is usually a good first radio. Icom ID-51A. The FM HT: Handheld transceivers are called HTs by hams, or sometimes handy-talkie. I recommend that you start with a handheld FM transceiver for 2-meter band (VHF) and for 70-centimeter band (UHF). These are two very popular bands and you will find most repeaters utilizing these frequency ranges. (In some portions of the US the 1.25-meter band is also very popular for repeater operations and may be a good choice as well.) There are many radios to choose from with various features and inclusions. I think it is best to start with a very basic HT, one without lots of confusing bells and whistles or special features, and therefore usually not too expensive. Choosing and setting up a first radio is where an Elmer or club connection really becomes convenient for the new ham. First Contact: I recommend that you make your first on-air radio contact after listening to a few other conversations. If you are in range of a repeater, monitor the repeater and listen to the character of the exchanges. Common language is used extensively in most circles, but you’ll hear a few jargon terms thrown in. You can reference the HamRadioSchool.com list of Common Ham Radio Terms as a beginning aid. When you’re ready, push-to-talk and make your first call as you’ve learned in your exam study and preparation, and as you have heard others do, using your new call sign. Don’t be afraid to identify yourself to others as a new licensee. You’re sure to be welcomed into the ham community and those other operators will help you by answering questions and making recommendations. Go For It! I hope this information has cleared up some of the typical confusion about how to get your ham radio license. This is not an exhaustive treatment of things for a newbie to be aware of, nor is it alone likely to be sufficient to quench your hunger for knowledge. But there are many other resources available, and the best thing to do is to just jump in. Go for it! Of course, I recommend you start by acquiring and reading the HamRadioSchool.com Technician License Course book, and by visiting our web site to review some of the many informative articles and to begin taking the interactive quizzes that are associated with each section of the book (Learning Material >> Tech Book Section Media). With HamRadioSchool.com you will really get it! You will understand ham radio, you will ace your exam, and you will be an impressive new operator. Get going, and get your ham radio license now! Good luck, and 73! What Frequency Do I Use On 2 Meters? What’s That Connector on My HT? This entry was posted in a. The Basics on July 30, 2014 by Stu Turner.